In an on-going process to connect more closely the activity of the Pontifical Commission for Sacred Archaeology (PCAS) to its umbrella organization, the Vatican's Pontifical Council for Culture, presided over by Cardinal Gianfranco Ravasi, a new website with TLD of the Holy See (.va), "Catacombe d'Italia," launched in the spring of 2018, under the direction of the recently-appointed PCAS secretary, Monsignor Pasquale Iacobone, a longtime staff member of Ravasi's council in the division "Art and Faith", brings into sharper focus the mission and purpose of the PCAS, a Vatican entity first set up as a government office in the era of the Papal States in 1852, and later determined "Pontifical" in 1925 by Pope Pius XI, through whose authority it was awarded a special. mission-based role in Italy's archaeological infrastructure as ratified in article 33 of the Lateran Pacts in 1929. Since that time, the PCAS has continued to inspect, excavate, document, and preserve, whenever possible, the ancient Christian underground cemeteries known as "catacombs" in Rome and other parts of Italy and to operate many as Christian pilgrimage shrines, though not all of the country's Christian catacombs are under its supervision and, by conventions in force between Church and State since the early 20th century, re-ratified by modifications to the Lateran Pacts (art. 12.2) in 1984, it continues to hold jurisdiction over some "mixed" or profane sites, like the Catacombs of Via Dino Compagni and Hypogeum of the Aurelii in Rome. Largely for convenience's sake, rather than out of a now-obsolete supercessionist ideology, from the early 20th century until the mid-1980's, the PCAS also looked after two catacombs in Rome used by Jews, one on the Appia by the name of "Vigna Randanini", and another on the via Nomentana, below the grounds of the Villa Torlonia, a municipal park since 1978. By request of the Union of Jewish Communities in Italy (UCEI), care of these Jewish sites was handed over to Rome's Archaeological Commission in the reworking of the Italy-Vatican Concordat in 1984 and decree of Italian law on Jewish cultural heritage in Italy (L. 8 marzo 1989, n. 101, art. 16-17). A few other catacombs on private property and long rendered inaccessible, or determined through modern research to be not necessarily Christian, have also been turned over to local government authorities, or left dangling and unclaimed until further notice. Many more, however, have been "adopted" by the PCAS, beginning in the 1970's, when its then-secretary, Fr. Umberto M. Fasola, B., an advisor to Italy's Ministry of Fine Arts, undertook a full census and mapping of Christian catacombs in Italy, resulting in the re-discovery and reclamation of dozens of sites, especially in the Lazio Region, many of which are accessible today (curiously, the necropolis below Saint Peter's Basilica, the property of the Holy See, excavated by PCAS authorities during the Second World War and its aftermath, and venerated today as the "cornerstone" of the Papacy's apostolic succession, is not a PCAS concern, perhaps because of its overall pagan nature and the heated debate over the apostle Peter's actual tomb and relics that pitted some Vatican clerics and their academic allies against the foremost Rome-based Christian archaeologist of his time, PCAS secretary, Fr. Antonio Ferrua, SJ). The PCAS mission to identify and especially to preserve and restore catacombs seems an endless (not to mention expensive) task, but the new website showcases recent interventions with photogalleries and slideshows of brilliantly-restored paintings, funerary architecture, and sculpture, as well as an updated catalogue of publications that document these works. The stunning visuals and mobile-friendly format of the Catacombe d'Italia website invite the public to discover "Underground Rome" (and Italy). Digging deeper into the site, however, evidences that the project is a work in progress, in terms of content (some of which is reproduced from the official Vatican/Roman Curia website) and responsiveness (social media widgets Facebook, YouTube and Instagram are inactive and online forms do not register). Fortunately, web site construction remains open-ended, and it is likely a matter of time before clarifications are made, since a responsive platform for PCAS operations, resources, and staff is very much needed and has great potential to attract even stronger public interest in the catacombs themselves. At present, only the stage - better still, template - has been set for what is to come. The landing page of "Catacombe d'Italia" is designed with touch targets and drop-down side menu for navigating through the site via pc or tablet. A quote from Cardinal Ravasi introduces the project's scope and content, reflecting upon the epiphany of sorts a pilgrim or tourist, even a non-Christian, may experience in contact with "the memory of many believers in Christ and His message", a reminder that the impetus from the start in forming the commission in the time of the "Papa Re", Pope Pius IX, was to promote the faith and cult practices of the early Christians in Rome through close study and living example. This "Second Damasus" during a record-long papacy (1846-1878) funded major excavations to uncover and restore sites that seemed to correspond perfectly to the literary record of the early Church in Rome and medieval practice of pilgrimage to martyrs' tombs. Pius's tearful salute to his remote predecessors during his visit to the "Crypt of the Popes" in the early 1850's helped launch decades of highly-publicized research in Rome's ancient "sacred" cemeteries by PCAS founding member Giovanni Battista de Rossi and colleagues. Not without difficulty and some illicit antiquities trafficking by way of financial compromise, Pius's agents funded the digs and purchased large swaths of property along the Appian Way to protect the tombs of ancient pontiffs and saints that lay beyond the boundaries of the Basilica and Cemetery of San Sebastiano. Today the fields of the Callisto complex between the Appia and Ardeatina roads are dotted with institutes and convent buildings; a like situation is found all over Rome near and above other "sacred cemeteries". Yet some burial grounds, particularly smaller catacombs outside of the circuit of the Medieval pilgrimage itineraries, only emerged in the course of modern construction, and are accessed with difficulty from the outer edges of private homes. It is to the PCAS's credit that, over many decades, it has battled to save from obliteration those sites dreaded and neglected by the modern landowner and building developer, notably the "Pinacoteca of the Fourth Century" on the via Latina. Fr. Ferrua's arrival on a scooter to a construction site usually spelled work delays if not financial disaster for a developer should a catacomb be seen (though most often it was not - as Rome is a sponge throughout for tunnels of every sort, ancient and modern). But without another "Damasus" after Rome fell to the Piedmontese in 1870, and in the face of severe budget constraints, the PCAS has been forced time and time again to chose its battles, with the inevitable loss or, at best, obscurity of underground cemetery galleries too poor or picked over to contain much of Christianity, or like signs of religious convictions, Jewish or polytheistic, even as expressed in the stock decorative motifs transferred from the sphere of the living to these dormitories - koimeteria, or cemeteries - of the Roman dead. But few in Italy's Fine Arts infrastructure have been willing to fight for the "anonymous" or "neutral" catacombs in Rome the way Fr. Ferrua and his colleagues could and did. Priorities in available government funding have never swept catacombs up in a thorough and timely restoration, excepting, in very recent years, those used by Jews at Villa Torlonia - and even here, "timely" is hardly applicable: only after thirty years of planning and lost opportunities is the end in sight. The sorry track record of secular Italian authorities explains in part the PCAS's continued existence, and what, in fact, has been possible to preserve of the underground cemeteries in modern times. Since the catacombs develop with distinctly Roman elements - no place outside of Rome really matches the ancient megacity in terms of the extent and elaborate planning of underground tunnels for inhumation by the thousands or even hundreds of thousands - a large amount of site content, both written and visual, is dedicated to the activity of the PCAS in the catacombs of Rome. Indeed, the catacombs on the Christian Catacomb page ("Catacombe cristiane") are defined as being "born" in Rome as collective funerary sites for Christians at the end of the second and beginning of the third centuries CE, including the "Koimeterion" identified with "Area A" in the Catacombs of Callisto on the via Appia, to which is added the "Crypt of the Popes" in a slightly later phase. Along these lines, the "cemeteries" of the Christians, though originating, in some cases, as private family vaults, took final shape as burial grounds for larger communities, unified by tomb location, but also, as the site points out, by the application of decorative elements on tombs that made reference to the belief in Hebrew and Christian Scripture, as well as more generic allusions to paradise, salvation, and positive self-identity. The exclusivity of catacombs as wholly Christian (or Jewish) is an old point of contention, but the archaeological evidence in situ or attributed to these sites favors a sequence of familial or collegial burial crypts developing over time into Christian and Jewish communal cemeteries, especially since not every individual living and then dying in Rome was buried in a catacomb - not even every Christian (or Jew). There is no need to feel "apologetic" about this view: even if Christians on occasion took over Jewish or pagan tombs, or Jews moved into pagan crypts, and religiously ambivalent individuals chose to be buried wherever it was convenient, the marketplace for funerary monuments in Late Antiquity provided much more than we are aware of today - and catacomb entrepreneurs acted accordingly in response to demand for a specific location. These largely anonymous managers and diggers, the "underground heroes of the Christian cemeteries", as termed by Lane Fox, of all people, are to be credited as much Church officials with Christianizing choice selections of the necropoleis around Rome. The rapid summary of catacomb chronology, development, and transformation into pilgrimage shrines with the construction of churches, facilities, and set itineraries to venerated tombs, is followed by a list of catacombs which are accessible to the public today ("Aperte al pubblico"). Organized by region (Rome, Lazio, Campania, Sicily, Toscany, Umbria, Abruzzo, Sardinia, and Apulia), each link opens to a page with a map of the region's catacombs and their contact information. The directory - being updated as this is written, as the pages for some of the regions, including Apulia and even Rome, do not yet appear - may confirm the good news that sites like Santa Lucia in Syracuse and San Lorenzo (or Cyriaca) in Rome are expected to be open on a regular schedule (a real comeback for the latter, publicly accessible until a decade or so ago). On a separate page, there is a directory of catacombs open by request ("Aperte su richiesta"), including two sites in Abruzzo (Castelvecchio Subequo and S. Vittorino ad Amiterno); two in Sicily (Villagrazia di Carini and Vigna Cassia), and three in Lazio (Vicesimum at Morlupo, Colle S. Quirico at Paliano, and S. Ilario "ad Bivium" near Valmontone - strangely absent are Santa Vittoria at Monteleone Sabino and San Salvatore at Albano, unless the latter will be grouped with those at Rome). As said, the Rome list is not loading, but when launched is likely to include recently restored catacombs and those easily accessible like Pretestato, Maius, Commodilla, Vibia, Generosa, and via Anapo, among others. Also not yet uploaded is a section of "Closed" catacombs deemed inaccessible, though possibly open for study purposes, if not for group tours. Hopefully, the end result of all this classification will produce a complete list of the many catacombs under PCAS jurisdiction: those open, open by request, currently or indefinitely closed, and a few no doubt impossible to access due to lawsuits and structural concerns. All in all, any clarity to the "sacred vs. profane" issue over which entity controls what in the world of Subterranean Rome can only help end stalemates between authorities, case in point being the lengthy delay in opening the Mausoleum of St. Helena Museum. The "upstairs/downstairs" division, in fact, limits "catacombs" to subterranean areas while many structures overhead, though very much part and parcel of the ancient cemetery, and often historic Christian shrines in their own right, fall under state jurisdiction, in the sense that their excavation and restoration are conditioned by permits and inspections by Italy's Fine Arts Ministry, not that of the Holy See. The PCAS "project" is not just informational, but also launches an open call for benefactors of its historic mission to recover, restore, and preserve ancient Christian cemeteries. The last category in the "Visiting Catacombs" section is called "Special Tours" (Visite speciali) with a list of tours to sites in Rome exclusive to PCAS donors (page under construction). The "PCAS Patrons" page (Sostieneci) explains more fully the challenge of maintaining more than 150 catacomb sites identified throughout Italy (something like 60 in Rome alone). In keeping with PCAS activity in over the past few decades, priority is given to the restoration of the paintings and sculpture in these sites. The featured project in need of immediate funding, however, is the building of a new roof over the Basilica of St. Sylvester in the Catacombs of Priscilla, as Italy's Fine Arts Ministry has rejected a proposal for a steel-reinforced covering, requiring instead that a more expensive wooden frame be used, although the building itself is a little more than a century old. Also described on this page is the work carried out on catacomb paintings and sculpture with funds from the Heydar Aliyev Foundation. The most recent project funded by this Azerbaijan-based organization, the restoration of sarcophagi in the Catacombs of St. Sebastian, is not yet featured, but its generous contributions to the Catacombs of Sts. Marcellinus and Peter helped to reopen the extensive cemetery to the public in all its splendor in 2014. In light of major restoration projects (in the Catacombs of Tecla, Domitilla, and Marcellinus and Peter), excavations in course (with the University "Roma Tre", where a number of PCAS officials teach), and events (such as "Appia Day 2018", with the opening of catacombs and museum displays ordinarily closed), it is important to know the lineup of PCAS members, officials, and inspectors who direct these activities. The page dedicated to the PCAS infrastructure ("La Commissione") sums up its structure, history, and current membership. Not well evidenced, but most critical of all, are the links to forms at the bottom of the page for requesting visits, including site inspections by scholars, filming and photographing in the catacombs, and ordering photographs from the PCAS' "Historic Archives". The pricing of some services can be steep, like the required hiring of an archaeologist guide (in addition to the custodian: scholars we know have been amused by this "need" for a guide to what few will know better than they do), and new photography fees in vigor from June of 2018 make slight increases in some categories. The historic photo archives, defined as "sporadic" in content, have not been updated since their launch online in 2014 (concerning is that entire albums available in the past now appear to be missing); meanwhile, thousands of color photos await to be catalogued in the PCAS office in Rome. Some other takeaways from navigating the new site for the PCAS: as noted above, it seems to have "open" planning, that is, to be regularly updated on its Events ("Appuntamenti") page. Hopefully, this feature will call attention to tours, exhibits, and other events in regional catacombs outside of Rome, like the monthly tours of the Catacombs of Generosa (Rome), and steady stream of receptions, concerts, and other artistic ventures in the Catacombs of Naples and Palermo. The Rome-centric approach also tones down that many regional catacomb managers operate more or less autonomously: for example, while photographs are strictly forbidden in Rome sites, the Naples guides allow photos, and a catacomb in Palermo is frequently the stage for secular performances. 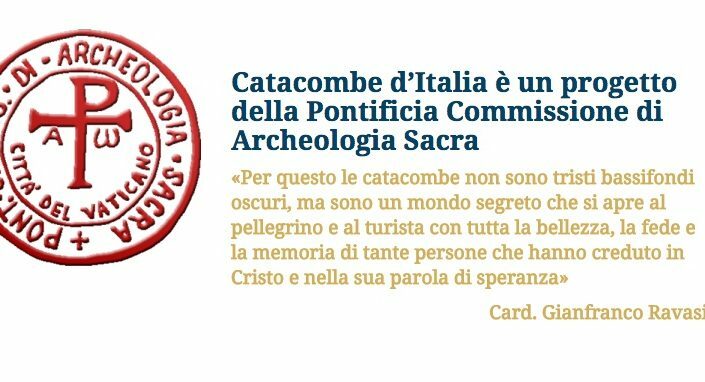 Cardinal Ravasi, in his statement on the site, addresses the pilgrim and the tourist to the catacombs. Much more could be done for the less casual visitor, the scholar. There are a number of works in progress or recently-completed studies in Italian catacombs carried out by the PCAS in collaboration with universities and professional agencies, but only the Roma 3 "didactic digs" are mentioned. Surely the "mass grave" in the Catacombs of Saints Marcellinus and Peter (subject of a full-length documentary); the many seasons of excavations in the "Circus-shaped" basilica of Pope Mark in the Callisto cemetery (1992-2013); geo-radar surveys, also made in the Callisto site; digital mapping of catacombs in Rome and Naples; the "MuPris" installation in the Catacombs of Priscilla; the topographical and epigraphical surveys in the Catacombs of Santa Lucia at Syracuse; and continued excavation in other regional sites - for example, at Canosa by PCAS Regional Inspector for Puglia, Prof. Paola de Santis - are among the most exciting archaeological projects in Italy today. Also quite interesting for the public record would be conferences that involve catacomb study, such as that on longtime PCAS secretary Fr. Umberto M. Fasola held in Rome last October, co-sponsored by the Pontifical Commission for Culture. Embedding Google Calendar or a similar widget into the site would make adding new listings a simple task. It is with mention of Fr. Fasola, Fr. Ferrua's immediate successor to the office of PCAS Secretary, that a final request is made. The Barnabite scholar is on record as personally humble, but, like his colleague Fr. Ferrua, with high standards in scholarship for colleague as well as for himself. No day was long enough, as he once noted in a private letter, to allow him to accomplish all he had to do as priest, professor, and PCAS administrator. Yet he found time, somehow, to make himself personally accessible to students and other members of the public, ready with suggestions and even offering himself as guide to the sites. The legacy of Fr. Fasola and colleagues, especially the Sisters of Priscilla, the Benedictine nuns at service to the PCAS until the time of its current administration, is characterized by outreach and public engagement. May the PCAS portal welcome new generations into the catacombs with equal openheartedness and dedication, the true signs of faith. Miraculously (for servers work in mysterious ways), just hours after posting a review of the PCAS's new website "Catacombe d'Italia", the missing page on Rome's catacombs reappeared with an enhanced list of catacombs in the city in the care of the Pontifical Commission for Sacred Archaeology (previous versions seen did not include many of the sites now listed). Very exciting is the confirmation that the Catacombs of San Lorenzo (or Cyriaca) in the Campo Verano are expected to reopen after repairs. This catacomb, with a winding, uneven route through the hillside surrounding the Basilica of San Lorenzo, has an intriguing layout, some real curiosities, like a perfectly-preserved columbarium, and the prestige of being one of Rome's great Medieval martyrial shrines, very easy to access from the city's central transportation hub at Termini Station. The public route will likely explore a few galleries around the lower church and cloister, but the busloads of tourists and faithful already visiting St. Lawrence's tomb will keep guides busy, and the parish priest is a noted enthusiast of his church's long history and characterization as a "cemetery church". Aside from an irregular distribution of floor levels, the catacomb, sacked in centuries past, can probably endure groups of visitors without more damage to its structure than what already has been done. The other regularly-open catacombs are: Callisto, Sebastiano; Domitilla; Sts. Marcellino and Peter; Priscilla; Agnes; and Pancrazio. The list of "Catacombs open by Request" happily includes remarkable sites that the public should know better, such as the Catacombs of Vigna Chiaraviglio and Catacombs of Vibia on the via Appia; the Catacombs of Commodilla on the via delle Sette Chiese; the Catacombs of Generosa on the via Magliana; that known as "Cimitero Maggiore" on the via Nomentana; and, in the neighborhood of the via Salaria, the catacombs of Pamfilo, Giordani, Felicita, and and Ermete. Note that the two lists of catacombs in this category on the website currently do not correspond, but the more extensive one is found on the menu of catacombs by region ("Per regione"). A third category has now been added: "Special Visits (for Patrons)". Here we find the Catacomb of via Dino Compagni (or via Latina); the Catacomb of Via Anapo; the Hypogeum of the Aurelii; the Catacombs of Pretestato and Sarcophagi Museum; the Crypts of Lucina and Torretta Museum; the newly-restored "Crypt of the Bakers" in the Domitilla Cemetery and Museum; and the Catacomb of St. Tecla near Saint Paul's Outside the Walls. Many of these cemeteries have been subject to restoration in recent years, and, until now, could be visited only by request. According to this website, they are now "reserved for (those)... who are interested in sponsoring (the PCAS's) activity of tutelage, conservation, and valorization of the Christian catacombs of Italy". Likely scholars and university programs will continue to have access to these sites as before, with fees for the custodian and a guide. There is no indication as to the minimum "donation" for an exclusive tour and prospective sponsors are invited to contact the PCAS directly at: pcas@arcsacra.va. It is a good idea and an old one to arrange special visits for patrons of a pet project - PCAS officers of the past, including de Rossi and Marucchi, cultivated wealthy donors of many nationalities, promising - and delivering - notable results. As for the "Closed Catacombs" at the very bottom of the list - the good news is that it is a short one, with three named: San Valentino, the Cimitero Minore, and the "Anonymous Hypogeum of via Paisiello (though in all honesty, parts of San Valentino are in fact accessible).